Mermaids are powerful and graceful inhabitants of the waters who can teach us about harnessing the unconscious mind’s ability to attract, create, and manifest . . . while having a fun and playful life! 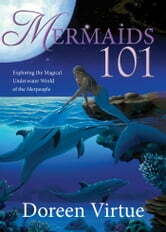 In this latest entry into her best-selling 101book series (which include Angels 101, Archangels 101, and Fairies 101), Doreen Virtue gives you the fascinating history of mermaids and mermen from Atlantis and beyond.